My name is Jim Joyce and I am the First Robotics Coach for Team 4815 rookie team from Center Line Michigan. I want to thank you for your Foundations support of Team 217…..The Thunder Chickens….. what a wonderful group of people…..teachers, mentors and students. Your support of the Thunder Chickens has allowed them to support us with tools, materials and a wealth of ideas, inspiration and hours upon hours of time to represent the community of Center Line with a competitive robot. 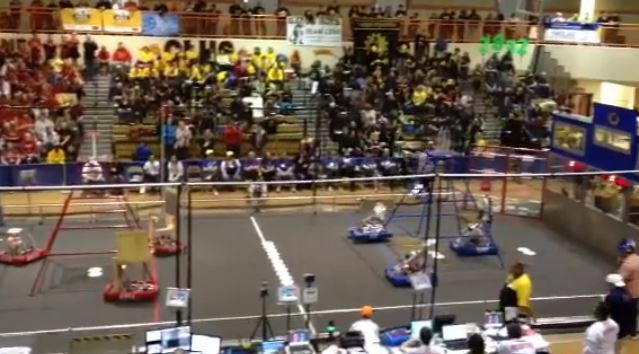 In our first competition that was held at Center Line High School we had the support and help from numerous Thunder Chicken Mentors, team members and past team members. With their guidance and help we placed ninth out of forty teams and actually had the opportunity to Captain the number seven alliance in the finals. We did get knocked out in the quarterfinals…but what a wonderful experience. We also received two awards….Highest Rookie Seeded Team and The Rookie Inspiration Award……none of it would have been possible without your support of this wonderful program through the Thunder Chickens. I want you to know that I came from the other side of the tracks……three sport athlete in high school and played basketball in college. As we went through this competition I could not help but compare it to my athletic endeavors. Time….the time and effort that these wonderful people put into developing a competitive robot for their team and helping us far exceeded the time that I put in on a daily basis as an athlete. The commitment that they have is extraordinary. As an athlete we might practice two hours a day five days a week not counting games, against a three to four hour commitment four days a week and much more time on the weekend and when it comes to crunch time there is a just do it….or we will do it attitude and get it done and we are not leaving till we do attitude. I can not imagine what it would be like to gather forty basketball teams together and put three teams together to play three other teams yet I witnessed these kids time after time get with other teams that they would be playing with and formulate a strategy to best take advantage of their strengths and than carry it out on the field. I believe this program demonstrates what teaching should be all about……not so much about history, not that history is not important….but more about here we are and how do we improve and move forward…..how can we better our product…how can we do better. So again I want to thank you for your support and let you know that it is very much appreciated. To learn more about our grants to support youth in robotics, please visit our grantee page for the ThunderChickens. The ThunderChickens have used their grant to support other teams in their area.